I’m so so pleased with how this pieced quilt back turned out. Not to mention impressed with how quickly I was able to sew it up. As you can see, it only vaguely resembles my initial schematic. My goal was to use up scrap pieces of fabric from the quilt front, from other projects and from ends of bolts from the workroom. I also really wanted to include a few fabrics that I had collected over the years. The turquoise leaves on cream was an ebay purchase a couple years ago that I hoped would go into my first quilt. The dark grey Lecien fabric along the bottom was the only fabric that I got in quantity specifically for the back. Using the schematic as my guide, I worked in sections, starting with the top right yellow block. Within each section I often had to piece several different fabrics together to make up the correct dimension that i needed. Mostly I let the fabric dictate where it would go. There was a definite feeling of synchronicity, as I laid the fabrics on the floor according to their size and colour. Once I put together a section, I worked on the adjacent section and then attached the two sections together. I made a couple ‘mistakes’ by attaching sections before I meant to which lead to a different configuration. I also rotated one section ninety degrees because the fabric patches seemed to be too lined up in the centre of the quilt. I kept running halfway up the stairs to look at how it was coming together from above. The aerial view was very helpful. I would also go all the way upstairs for a minute and return to see how it looked as I was descending and the quilt was ‘revealed’. Ridiculous, I know, but do you know what I mean? One of my favourite details is the mini patchwork stripe the runs across the bottom. This is made up of all my scrap cut offs from the quilt front blocks. I sewed the little pieced strips together into two very long strips which I trimmed and sewed to each other. I plan on doing a couple sets of pillow cases, also using this detail. I guess this means I now have to baste this massive thing together. Oh geez. I’m going to hand quilt the entire thing, so it might be a while before you see it again in its entirety. Just know that I’ll be sitting in front of the tv over the fall happily stitching away. OH MY GOSH. It’s beautiful! I love it. I’m so impressed that your quilt back is just as stunning as the front. Good luck with the quilting! I’d love to try hand quilting some time, but for now I’m still struggling with machine quilting and laughing that the pattern came from a book with “Last Minute” in the title. Each rectangle takes me so long to sew on the machine. Now that I’m on the outer borders each rectangle of quilting takes forEVER. Hand quilting in front of the television sounds so cozy and peaceful. Clear off the Big Table and let’s get this thing BASTED!! I’ll help! That looks fantastic! I really like the turqoisey leaves on the cream. For some reason they remind me of peace doves. I do have one question though…as a total quilting virgin I am confused. It looks like it has already been sewed together but it still needs to be basted and sewn? Huh? How is it attached now? anabela – i couldn’t help myself with the back. i wanted to have two quilts in one, especially since it has taken so long to make. It sounds like you’re going to be ready soon to do the binding on your quilt. i’m so excited for you! johanna – at the very least i need some key pointers from you about the basting… for hand quilting, what do you think – pins basting and thread basting? i plan on just doing straight vertical lines from top to bottom. rebecca, michelle, ella – thank you for your sweet words. i’m so proud. i can’t imagine how i’ll feel when it’s done! charlotte – i certainly was unclear with the ‘basting’ statement. in quilting, when you sew blocks of fabric together, this is called ‘patchwork’. once you have a front piece and a back piece, you layer them with batting in the centre. ‘quilting’ is when you sew these three layers together – top, batting and back. in order to keep all these layers set in place for the ‘quilting’, you need to ‘baste’ all the layers together. this can be done with safety pins or thread or both. this prevents the layers from shifting during the ‘quilting’ process. does that make sense? so what i’m about to do is baste the back, the batting and quilt top together so that i can start my hand quilting. anyone else should pipe up, if i missed something in my explanation here. This is just beautiful! I love it when the quilt back is just as interesting as the top. I understand completely about checking how it looks as you’re putting it together. Just last night I laid out my quilt top in one room and kept walking out and then reentering to see how I felt about the color placements. I felt a little crazy, so I was happy to read that you were doing something similar! Can’t wait to see it all completed! Just gorgeous and not what I would imagine a “traditional” quilt! I might just sign up for that quilting class now…. lovely! kaaaaryn…everyone’s blogging about quilting (perhaps because it’s getting colder) and it’s making me want to learn how to quilt even more! is there still space for the presto nine patch class? Your quilt back is very pretty. I liked pieced backs, I think. 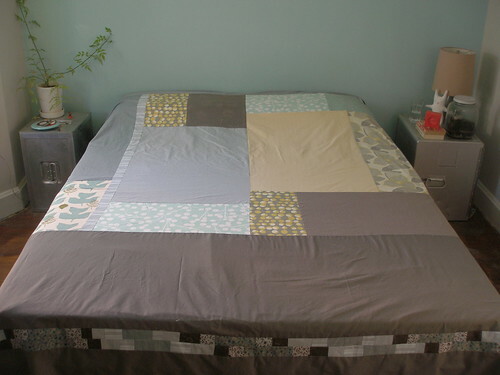 I am piecing one right now, and it’s a great way of using up leftover fabrics. Hand quilting is pretty relaxing. I’m working on a nine-patch quilt right now, and it sits in a jumble on the couch in between quilting sessions. I work on it each time I sit down to watch tv, so it’s coming along slowly, but I definitely don’t feel frustrated by it. I’m going to quilt my next quilt on the machine, though, cause it’s for someone else and I don’t want to still be working on it in ten years. Anyway, I think you will enjoy the hand-quilting process, especially if you’re the kind of person who likes to have something to occupy her hands while watching tv. Karyn- about the basting: you could just do the pin-basting if you want. Just use a jillion pins. Even if I pin-baste the whole top, I still like to run a line of thread basting around the sides. I like how the layers are better controlled at the sides with the thread. And don’t forget to remove the pins that will be caught between the hoops of the quilting hoop. You are using a quilting hoop, right? And tape!! My good friend Tape as a guide for sewing long straight lines!